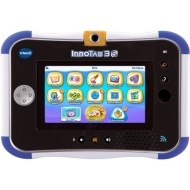 alaTest heeft 70 reviews verzameld en geanalyseerd voor VTech - InnoTab 3S Plus. De gemiddelde beoordeling voor dit product is 4.2/5, vergeleken met een gemiddelde beoordeling van 4.5/5 voor andere producten in dezelfde categorie. Gebruikers waarderen de apps zeer. We hebben de consumenten- en expertbeoordelingen, de leeftijd van het product en andere factoren geanalyseerd. Vergeleken met andere producten in dezelfde categorie krijgt de VTech - InnoTab 3S Plus een alaScore™ van 85/100 = Zeer goed. This product overall is great my son loves it he's able to play games read books he and his sister are able to swoop out games as well they love this vtech inno tab. I bought it for my niece. I really hope she enjoys it. As of today I have not downloaded any reading materials for my son and its so difficult just to do so. I still need help downloading materials to it. Someone suggest something easier - downloading. Was looking for a tablet for a 2 year old. This was the one geared to that age and above. Great deal. It was a wonderful, great, awesome, experience that I had. Very useful for learning for kids. Very self explanatory. Kids love it. Brought for my 3 year old for Xmas. Returned to the store and will purchase a regular tablet. Very difficult to sync with the computer. Great product for ages 3 and up! The games are perfect for their ages! We own this tablet and very happy with it, I got this tablet as a gift.